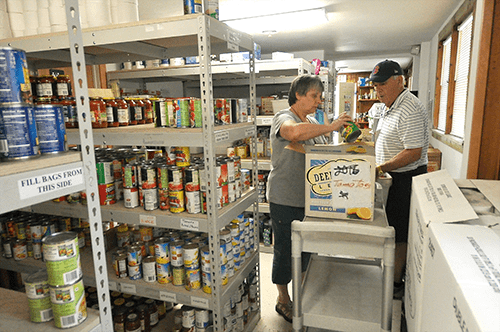 The Guilford Food Pantry takes donations every Friday between the hours of 9:00am and 12:00pm. If you have conducted a food drive and have an unusual amount of food to donate, please call 203-453-8166 and you may be able to set up an alternate time and date for your delivery. The Center\'s staff is very cordial and helpful and will work with you. This Thanksgiving 2014 Season will close its drive at the Food Pantry at noon today, November 21. The VFW in Guilford is working with the Guilford Food Bank and distributing Thanksgiving Baskets on Tuesday the 25th. They will also be ACCEPTING DONATIONS of turnkeys, hams, and non perishable food items straight thru the weekend until Monday. Please call 203-453-9252 for any questions of to confirm their hours. Food Donation Hours at the VFW: November 21 2:00pm all afternoon and early evening November 22 11:00am thru the day into evening November 23 12:00pm thru the day into evening November 24 1:00pm thru the evening Please remember that there are people in our community who don\'t have the resources and opportunities that many of us do and need a helping hand. Please take 30 minutes and drop off what you can at the VFW at 104 Mill Road in the big red building and may we all be thankful for our lives and loved ones. Happy Thanksgiving. Your opinion matters. Leave A Review Or Edit This Listing for Guilford Food Bank. We always need more information on our pantries. If you know of any details, volunteer information, website, hours or more description information about Guilford Food Bank please add a comment (below the map on this page), with information. We will then display this for all visitors on this page.